Hanzawa Naoki works for Tokyo Chuo Bank as the head of the Loans Division at their Osaka Nishi branch. The overbearing branch manager, Asano, forces him to award an unsecured loan of 500 million yen to Nishi Osaka Steel. On the surface, Nishi Osaka Steel seems like a very reputable company, but in actual fact it is a company in deep trouble. Debt-ridden, the company accountants resort to window-dressing the financial statements in order to hide the truth from the public. Three months after the loan, Nishi Osaka Steel goes bankrupt and the ambitious and power-hungry Asano makes Hanzawa the scapegoat for the 500 million loss. 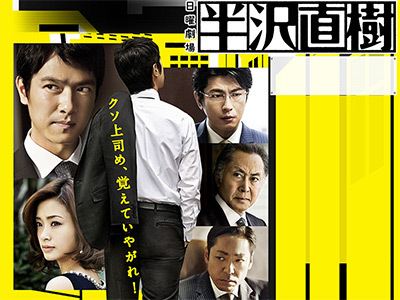 Hanzawa is called to Tokyo to answer to the internal investigations team, where he vehemently denies responsibility for the loss, and swears to recover the 500 million yen. That is the only course of action for Hanzawa, if he wants to survive in the banking industry. Hanzawa Naoki is a well-rounded, well-acted drama centered around the character of Hanzawa Naoki (portrayed by Sakai Masato) and his battle against seemingly impossible tasks. I will start by commenting on the similarities and differences vs. Legal high, that people often compare it to. My opinion is that the only common thing between these two jdoramas is the main actor. Other than that, they are very different series, and comparing them does not make sense or justoce to either. Legal high is a comedy, in which Sakai Masato plays outrageously to build on the comedy. Hanzawa Naoki is a drama, with its fun moments, but it is a drama. The characted played by Sakai Masato is quite different, and he does an absolutely fantastic job depicting the character, bringing such intensity to the acting that few other actors would have been able to. Now for the series itself. It is simply a very good drama. The scenario is well written, it unfolds in 2 parts (at the branch and then at the head office) while the back story reveals itself. The acting is superb (I already mentioned Sakai Masato but Kagawa Teruyuki is particularly impressive as the evil Owada, and Ueto Aya is surprisingly good is her supportive role). The side stories work and are again well-supported. You get the occasional laugh and the story is not dark. All in all, a very good drama that will make you forget the performance of Sakai Masato in Legal High and only remember this one. A recommended watch. Bankers and business are subjects that I have zero interest in, but with the phenomenon this became I felt I had to watch it. So my initial impression stood true for the whole series, and this may sound crazy to say about a show whose final episode had the highest ratings of any drama in 30 years, but basically this is just a lesser version of "Legal High." In a more normal version of reality this would have been made first, and would have become the greatest of classics, and Legal High would have been a silly spoof that took this actors antics to extremes, but we just so happen to live in some alternate dimension of reality where the spoof was made first. Sakai Masato's characters are the exact same in their sleazy, geeky, tanuki like looks and mannerisms, and in their amazingly powerful outbursts, but complete opposites at their core, where in Legal High he was fundamentally rotten and here he is on the side of justice, but again Legal High worked better with this, where it was more pronounced and hilarious, where this mostly comes off as unintentionally funny. Wondering why this was so popular, I noticed a Japanese person on a thread mentioning that Japan loves a story with clear cut bad guys being defeated by the good guys. I found this to be the exact opposite of the norm. It has always been my impression that Japan excels at the relatable villain types, and lots of gray area. This drama felt incredibly western to me. But regardless of what I say, the simple point remains that just like the entire nation of Japan, I was swept up into this drama, and it succeeded in making even me glued to my television in anticipation of what this BANKER would do next! But then... THAT ENDING! It really irritated me. There was no doubt in my mind that with this shows ratings they would, like greedy bankers, be milking it with a sequel or ten, but that's still no excuse to not give this show a decent ending. And on that same note, this show has basically it's own built in sequel, and while I usually love two arc story lines in dramas, the first half was definitely better. So I don't look forward to all the cashing in this series is sure to receive. At the beginning when I read the synopsis the first word that came to my mind was "Boring", What kind of interest must have a dorama about a banker? ?, I thought. However, don't get fooled about the same impression I had, the structure of the show is amazing, with an extremely interesting story, charismatic rivals, superb dialogs, a great soundtrack that fit so well with the scenes, and an incredible way to create turn of events, what in French is known as Coup de Theatre, all prepared to success. But if I finally decided to watch this dorama was due to the high tv ratings that it got in 2013, when it was aired by TBS. It's incredible to see how the ratings in Kanto area passed from 19.4% of the first episode to an impressive 42.2% of the last one, being even higher in Kansai, where by the way part the action takes place. This is an enough reason to check it out. I've been watching more Korean dramas lately but decided to watch a Japanese one and ran across Hanzawa Naoki, and was so happy that I did! Nicely paced drama that shows the inside of the Japanese banking system that few see. Japanese drama's don't drag on like their Korean counterpart, and this one ended a bit early, but I'm so glad there will be a season 2. Kagawa Teruyuki is amazing in this drama as his acting and especially his facial expressions convey more than any words he says. My wife says he is a traditional theater actor in Japan who just started doing TV recently. I hope he does more because he has a screen presence few actors have. The only reason I didn't give this drama a 10 was because of the ending, but other then that it's well worth watching! Holy monkey balls. This was one impressive watch. The content is a bit difficult to understand sometimes, but Sakai Masato's performance as Hanzawa was mesmerizing. The acting throughout this drama was ridiculously good, especially from the main cast. Kagawa's Ohwada was so easy to hate. It was also cool that it had two parts to it. I also must compliment the soundtrack to it. It's perfect. Ahhhh I just love this. I'll also mention that some of my students (as young as elementary school grade 4) were watching this drama and loving it. That's intense. P.S. The way Kurosaki talks grosses me out super bad. Intense, with multiple plot lines and plenty of corruption to fight. Sakai Masato has mastered the going-from-super-nice-guy-to-super-tough-guy-and-back-like-flipping-a-light-switch character. Oikawa Mitsuhiro and Takito Kenichi do a great job of rounding out the "3 Musketeers" against bank corruption. Ueto Aya is ridiculously cute as always, Kataoka Ainosuke is hilarious, and Dan Mitsu... well, you'll just have to see her for yourself. Initially I thought this was going to be very good. I mean "Fumo Chitai" or "Shiroi Kyoto" good. But after awhile all the yelling, screaming, rolling eyes, pounding on tables, extreme close-ups, I was saying to myself, "Get it over with already." In a drama filled with bad overacting I'm casting my vote for Kataoka Ainosuke as worst overactor of the century. Best drama in this season, proved by incredible rating view. The story is related to people nowadays. "Banks lend umbrella on a clear day and take it away on a rainy day". Interesting 9 points because we get an introduction into the world of japanese banks. I finished watching in 4days. very exciting and intriguing story plot. though Sakai Masato (when he din talk), I do get confused with LH's role. this drama is highly recommended. even supporting actor and actress are worth watching for. I personally think that Hazawa's extreme methods could never be tolerated by a big organization like this. Nonetheless, a storyline revolving around bankers is pretty new and interesting. First 5 eps. make up the first part. 6th - new story, larger amount. Sakai does a good job; I like his character. Good support from Oikawa, Takito, Akai (in the first part), and Ueto. Awesome plot with nice twists.